The people at Canadian Beef are once again offering a scholarship to Eat Write Retreatthis year. I tried to win one last year, but sadly the random selection gods were not smiling on me. I’m giving it another shot this year with an extra beefy recipe. 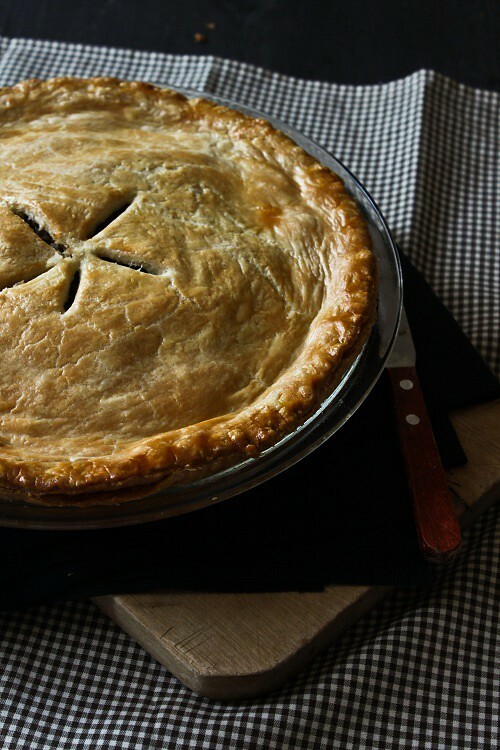 This recipe for Tourtiere, a French Canadian meat pie, is adapted from this recipe by Martin Picard. If you’ve ever seen The Wild Chef you know Martin is a little special, and if you’ve seen this episode of The Layover you know he takes Celine Dion very seriously. But to really appreciate Martin Picard, you need to eat at Au Pied de Cochon, his restaurant where traditional French Canadian meals are turned extraordinary (mostly through the addition of copious amounts of foie gras). 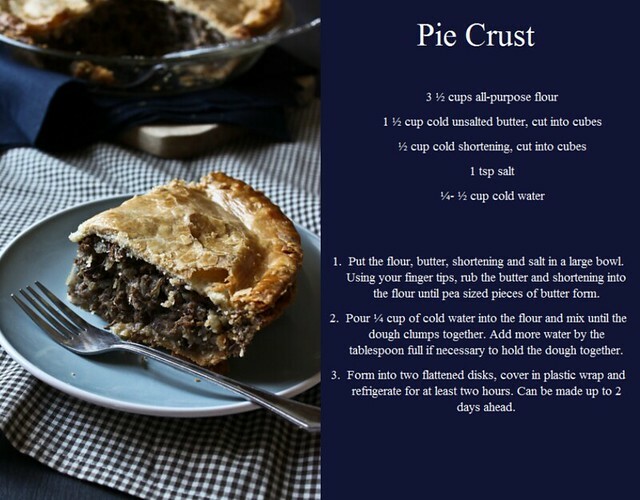 I managed to get reservations to the PDC Cabane a Sucre for this season and to get myself ready I decided to try this recipe. The original recipe called for pork, but I swapped the pork shoulder for blade roast and the ground pork for beef. The results were very, very good. Using two kinds of beef creates a nice combination of textures, and the different cooking methods for each adds layers of flavour. This is not a recipe that can just be made on a whim, it’s really a two day affaire. I made the crust and the filling on Saturday, then assembled the pie on Sunday. I hope all the beefy goodness is enough for the random selection gods. What makes you happy? I’ve been thinking a lot about this question lately, mostly in a work context. Turmoil at the office has me thinking about what I want to be when I grow up. Yes, I know that by all reasonable measures I am a grown up, but I’ve always gone with the flow and let circumstances lead me rather than making real choices. Not really grown up behaviour. Circumstances have now led me to a place that makes me very uncomfortable, and I’ve realized need to take control. When I think about what I want to do I draw a complete blank. The question seems so huge I can’t manage it. So I’m trying to frame the question differently; what makes me happy? The answer to that question tends to be little things. A Tuesday night with friends and wine.. my yellow rubber boots.. singing at the top of my lungs in the car. And a great meal with family. The kind where everyone is there, my cousins telling the most ridiculous stories, and all of us feeling stuffed beyond belief. 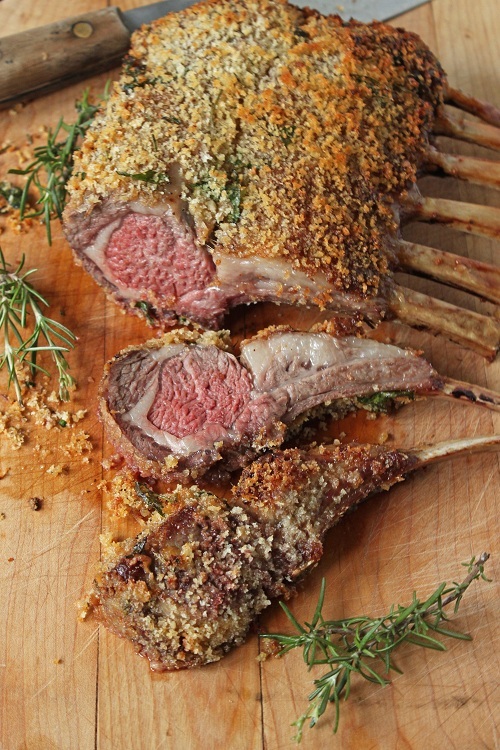 A staple at these meals has always been lamb, one of my favourite things to eat. This doesn’t really solve my career issues, but having lamb for dinner Sunday night did make me feel a little better. The little things will always be there, no matter what goes on in the office. 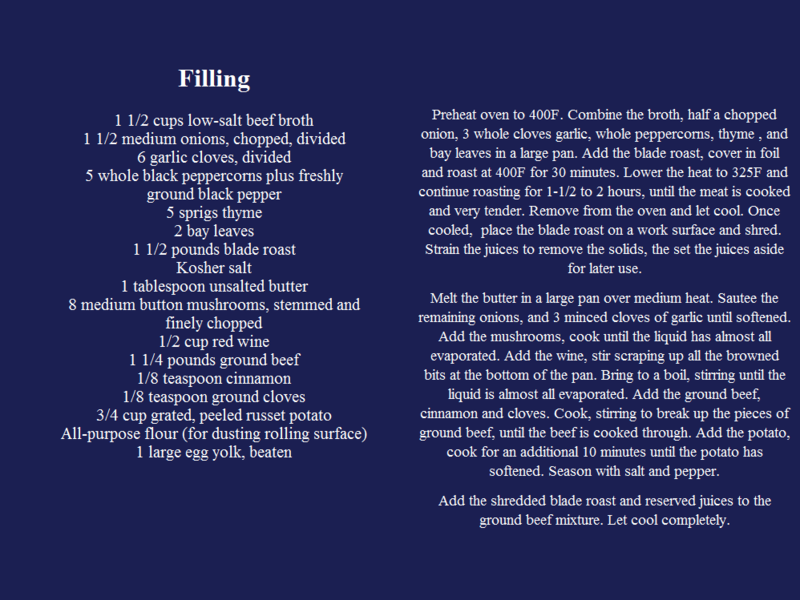 My dad usually handles the lamb, but since I planned on blogging the recipe I decided to make it myself. I did go to him for guidance though, like should it be roasted with the fatty side up or down and how will I know when it’s done? The fatty side should be up, and there’s a pretty neat trick to figuring out if it’s done if you don’t have a meat thermometer. Press the thumb and index finger of your left hand together, now with your right hand poke the fleshy part of your thumb. That amount a give is what you would feel if you poked a piece of lamb that’s cooked rare. Press your thumb to your middle finger, and that amount of give is what you would feel from medium. The next finger over is well done. Or you could just use a thermometer. Today was a rough day at work. A new VP for my division was named a couple of months ago, and as always a change at the top means changes throughout. My department wasn’t directly impacted, but someone I worked for for years has been shuffled out. I respect her very much as a manager, and over the years I had come to see her as a friend. She has always been there to listen and offer advice. I’m not worried about her, but I am sorry to see her go. I hope our office friendship has what it takes to be a real friendship. The announcements and the feeling of uncertainty change always brings has me pretty down. It’s the kind of day that calls for comfort food. Shepherd’s Pie is a favourite of mine, one of those dishes that soothes the soul. I based this vegetarian version on a Chuck Hughes recipe. I’ve made this a few times, each with a little change. Originally I used goat cheese then switched to feta. I’ve also gradually be upping the sweet potato to regular potato ratio. I think all of my adaptations have led me to something pretty tasty. Combining the sweet potato with regular potato allows the sweet potato flavour to shine through while the regular potato cuts down on the moisture. I really like the combination of lentils and spinach with the mushrooms, and I truly believe feta makes everything better. Well, almost everything. Soak the lentils in 2 cups of water for 1 hour. Drain then set aside. In a medium pot, fry the onion in olive oil over medium heat until translucent. Add two cloves of garlic and fry until you can smell the garlic. Stir in the lentils, then cover with two cups of water. Add the bay leaf, thyme and rosemary, along with salt and pepper to taste. Bring to a boil then simmer until the lentils are cooked, about 30 minutes (you can taste the lentils to test). Drain the lentils and set aside. While the oven is heating prepare the spinach and mushrooms. In a medium pan, fry the mushrooms with the final clove of garlic until browned. Stir in the spinach, season with salt and pepper, then stir in the lentils. Remove from the heat. 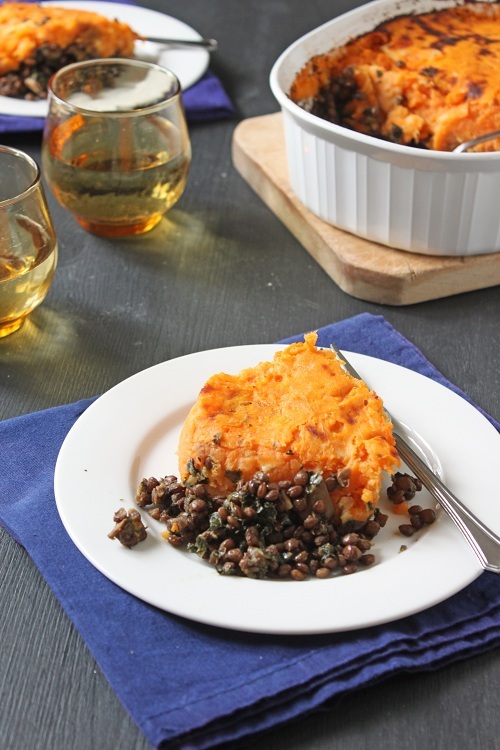 Spoon the lentil mixture into a baking dish, then top with the mashed potatoes. Bake for about 30 minutes, until the top starts to brown. We’re at the tail end of our Indian Summer here in Montreal. For close to a week it’s been hot and muggy, but the forecast for the weekend is cold and rainy. 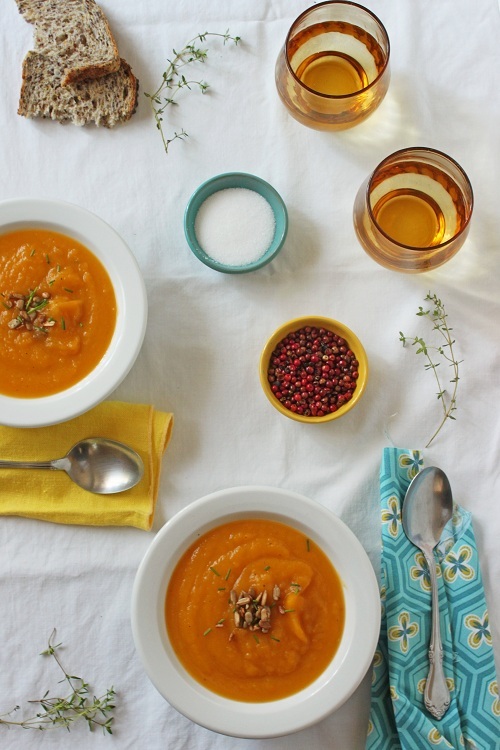 It’s officially time to start thinking about cold weather foods. Although I’ll miss the heat and sunshine the Summer brings, Fall foods are my favourite. Soups and stews made with harvest vegetables, shepherds pie, roasted squash; all of these are warm and comforting to me. I could go on for hours about Fall baking, but for now I’ll just keep it to these two words: pumpkin pie. 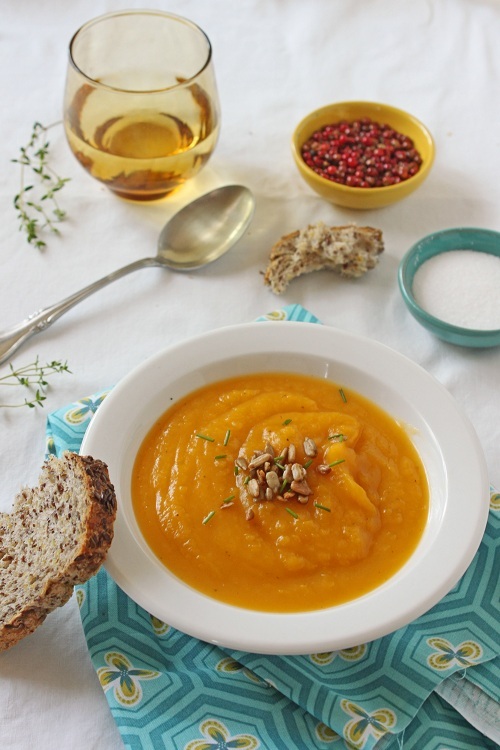 We had a little preview of the cold weather a couple of weeks ago, so I took the opportunity to get a head start on the fall cooking and made this Roasted Squash Soup. This is possibly the easiest dish I’ve ever made, if you’re new to cooking this is a great recipe to make you feel like you can do it. Simply roast the squash, onion and garlic until the squash is cooked, then transfer it all to a pot adding chicken broth and spices. Easy peasy! Roasting the squash, onions and garlic add a sweet, caramelized, dimension to the flavour of the soup. I made it quite thick because I like it that way, but if you prefer a thinner soup simply add more broth. I also use a touch of cream to add .. creaminess to the soup (there must be another word for that, richness maybe? ), but that can be omitted if you’d prefer to keep the dairy out. Let the squash cool slightly, then scoop out the flesh into a medium pot along with the onion. Unwrap the garlic and squeeze it into the pot (the cloves should slide right out). Add the chicken broth, thyme, sage, salt and pepper. Bring to a boil then simmer for 20 minutes, stirring occasionally. 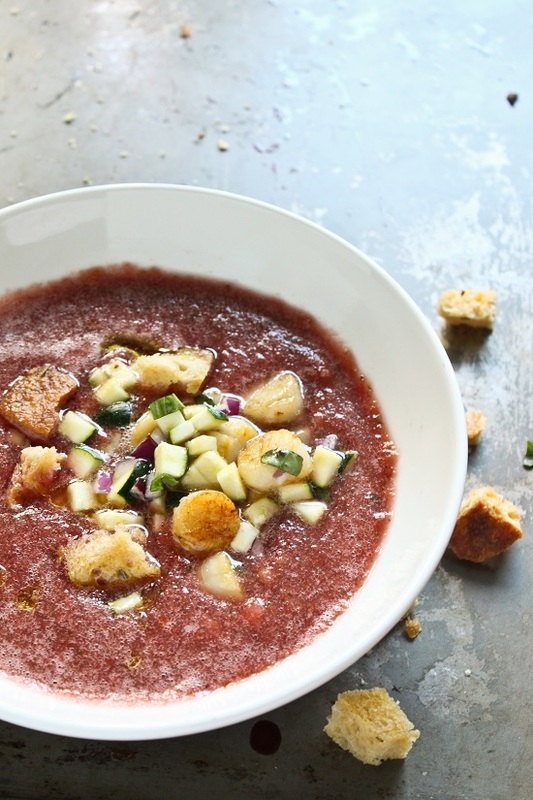 Let the soup cool then puree in a blender or with an immersion blender. Stir in the cream and serve garnished with sunflower seeds and chopped chives. September has what I’d call a split personality. Even though I haven’t been in school for quite awhile it feels like the beginning of a new year, a time for fresh starts and new shoes. It’s full of excitement and possibilities. At the same time when September rolls in there’s a feeling that something is coming to an end. Night falls a little earlier every day, the temperature starts to drop. That carefree feeling that summer brings starts to slip away. When I feel it going I do whatever I can to hold on to it even tighter. This summer hasn’t been all that care free for me. We’ve been short staffed for months, which led to long days with no time for breaks and sometimes no time to eat. On top of that a new VP for my division has once again brought a sense of uncertainty to the office. We’ve been “restructuring” for so long I can’t remember what structured felt like. All of this meant I was counting down the days to my vacation. It finally began yesterday. My intention was to sleep in, but my body had other plans so I was up pretty early. 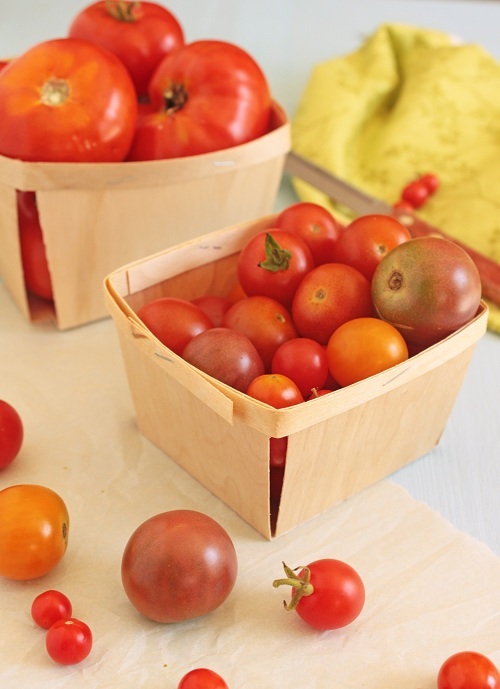 I headed out to the Farmers Market in St-Anne-de-Bellevue and picked up some gorgeous cherry tomatoes. I just discovered the market recently. It’s in a beautiful spot along a boardwalk. As you choose you vegetables you can look up and see the water. Shopping at a market has completely different feel than going to a grocery store. The vendors are all passionate about their products, the shoppers are all happy to be there. People are relaxed and smiling. It’s much more pleasant than the hustle and bustle of large grocery store on a Saturday morning. The photo above has a combination of market tomatoes and some from my parents garden. Tomatoes fresh off the vine taste like sunshine (true story). I’ve been eating as many as I can while I can. 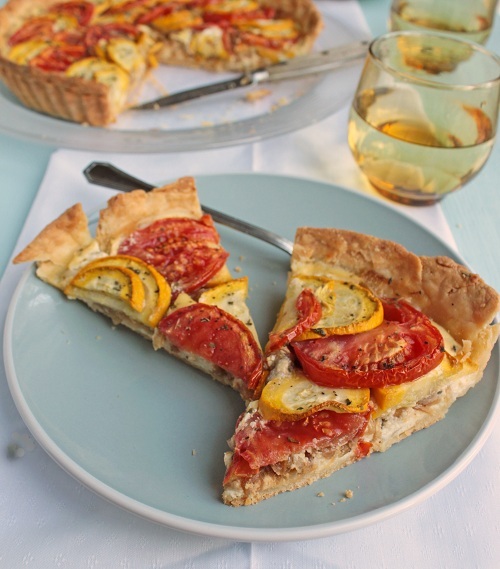 I’ve been thinking about a tomato tart since the beginning of tomato season; once September rolled around I realized I was running out of time to make it. I stopped myself from eating all of the tomatoes and put this together. The top layer has tomato and yellow zucchini slices. Underneath that you’ll find a layer of caramelized onions and garlic, and finally there’s a layer of goat cheese and ricotta. I was really happy with the way this tart turned out. The dough has a little corn flour in it, which I think helped it stand up to all the wet ingredients. Even the next day the crust was still crisp. The onion layer added some depth to the flavour and was a great compliment to the tomato and zucchini. I was going garnish the tart with some fresh basil but completely forgot. It wasn’t necessary but I think it would have added a nice touch. Although the recipe is not difficult, it does take some time to put together. There are two chilling times for the crust, 30 minutes to blind bake the crust and then another 40 minutes of baking time. To save time, the dough can be made up to 24 hours in advance and refrigerated, or frozen for a week or two. Make the crust: In a large bowl mix the flours, 1/2 tsp salt, sugar, and thyme together. Using a pastry cutter or your finger tips, cut the butter into the flour until it hold together when squeezed and there pea sized pieces of butter. Mix in the yogurt and ice water. The dough should come together, add more water if necessary. 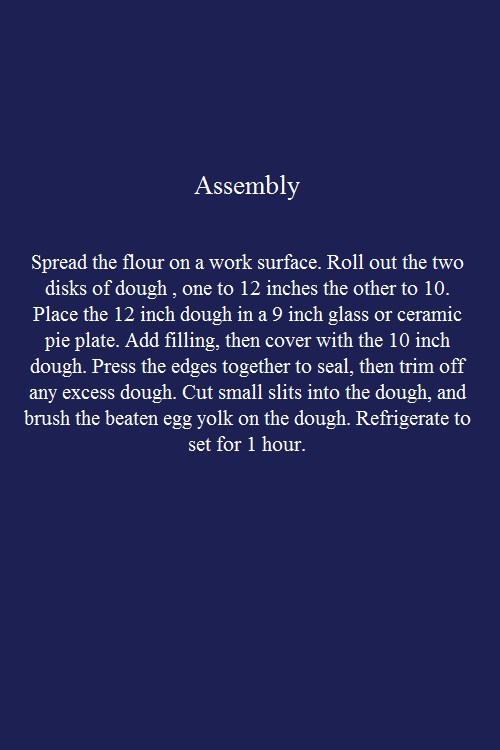 Shape the dough into a disk and refrigerate for at least one hour, or overnight. On a lightly floured surface roll out the dough to 1/4 inch thick. Place in a 9 inch tart pan and refrigerate for 30 minutes. Cover the dough with foil then place dried beans or pie weights on top. Bake in a 400 degree oven for 30 minutes. While the crust is baking, cook the onions. In a large pan on medium heat some olive oil then add the onion slices. Lower the heat and stir the onions until they start to brown. Add the balsamic vinegar and continue cooking. Once the onions are browned add the minced garlic, salt and pepper. Cook two to three minutes longer. In a bowl, mix the ricotta, goat cheese and egg. Season with salt and pepper and 1/2 tsp basil. Once the tart crust is done remove the foil and the weights. Pour the cheese mixture into the crust, cover the cheese with the onion mixture, the layer the tomato and zucchini on the onion. Brush the tomato and zucchini with olive oil, season with salt and pepper and the remaining dried basil. Bake for 40 minutes or until the vegetables are tender. I’ve changed my blog theme again. I think I might have theme ADD. That’s one of the reasons I’ve stayed with wordpress.com, it’s incredible easy to change everything. I think I might stick with this one for awhile though. Last time I changed themes I wanted something cleaner, but what I ended up with felt heavy to me. It was just too manly. This is more what I was looking for; clean, light, with a little touch of girly. I like it, and I hope you do too. In other news, I’ll Have What She’s Having now has a Facebook Page. I realized recently that I had advertised this on Twitter and Stumbled the page, but I never actually told my readers. I’m using it as a forum to share my posts as well as posts from other bloggers that catch my, plus the occasional food news. And finally the recipe. I saw a photo in the most recent issue of Ricardo Magazine of Ratatouille Pizza and I knew I just had to try it. This is the perfect time of year to make ratatouille; peppers, zucchinis, and eggplants are all at their peak. It’s great as a side a couple of times but then what? I like to use it as a pasta sauce for baked pasta dishes. Ricardo recommends canning it and using it at a pizza sauce in winter when vegetables are just kind of sad. I obviously couldn’t wait that long. I used his ratatouille recipe (translated to English below) and some store bought pasta dough as I have yet to master the art of homemade pizza dough. 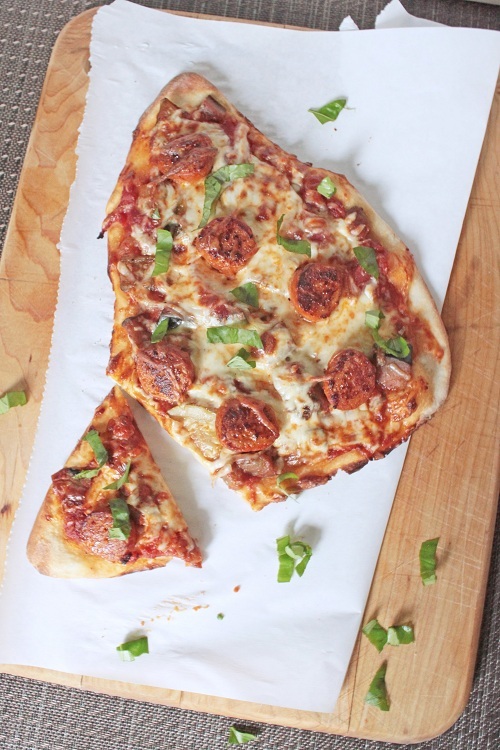 I topped it with cooked Italian sausage and mozzarella. This was hands down the best pizza I have ever made, and it was better than most delivery pizzas I’ve had too. This recipe is definitely a keeper. The photos I took were all a little out of focus, but I’m sharing anyway because this was just so good. As this is a magazine recipe I will be submitting it to Magazine Monday. It’s been forever since I did a Magazine Monday Post so for those of you who don’t know, it’s an informal blog event hosted by Ivonne over at Cream Puffs in Venice. Make a magazine recipe, send her the link, and she’ll share it with her readers. Easy peasy. In a very large pot on medium high, heat about 2 tbsp olive oil. Add the diced eggplant to the pot along with a touch of salt and pepper, brown the eggplant. Once browned, remove the eggplant from the pot and set aside in a large bowl. In the same pot brown the diced onion, adding more oil if necessary. Once browned add the onion to the eggplant bowl. Brown the sliced mushroom then add them to the eggplant and onion. Brown the zucchinis and green pepper, along with some salt and pepper. Add the tomato to the zucchini and green peppers, followed by the eggplant/onion/mushrooms. Add the time sprigs to the pot then simmer for 30 minutes. Remove the time sprigs then stir in the fresh basil. Turn off the heat. Serve as a side dish, pasta sauce or on pizza. 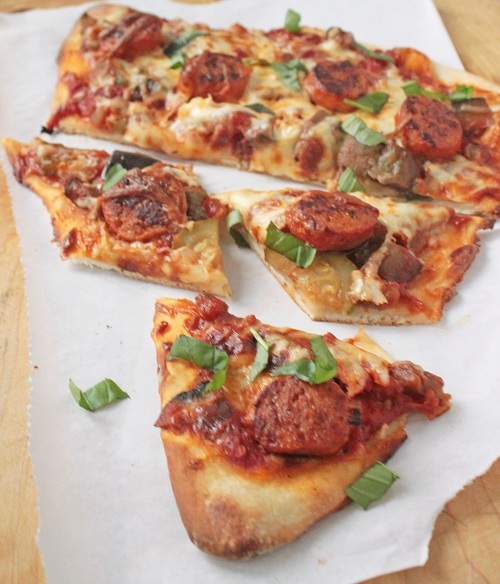 Roll out the pizza dough then place it on a greased and floured baking sheet. Top with the ratatouille as a sauce, then the sausage and cheese. How often do you make recipes from blogs? Although I read a lot of food blogs, I rarely follow recipes I’ve found on them. I read food blogs more to follow the people than the recipes. Every blogger has their own story to tell, and a style they use to tell it. My favourite blogs are the ones that engage me, the ones that give the impression I’m actually getting to know the author. Pretty pictures help too. That’s not to say I only read blogs for the articles. The recipes inspire me. Sometimes I’ll see a blogger use an ingredient in a way I had never considered, which makes me think of other innovative things to try in the kitchen. Other times I’m inspired by the simplicity of a recipe. This salad was inspired by a very simple pasta dish by Paula of bell’alimento. 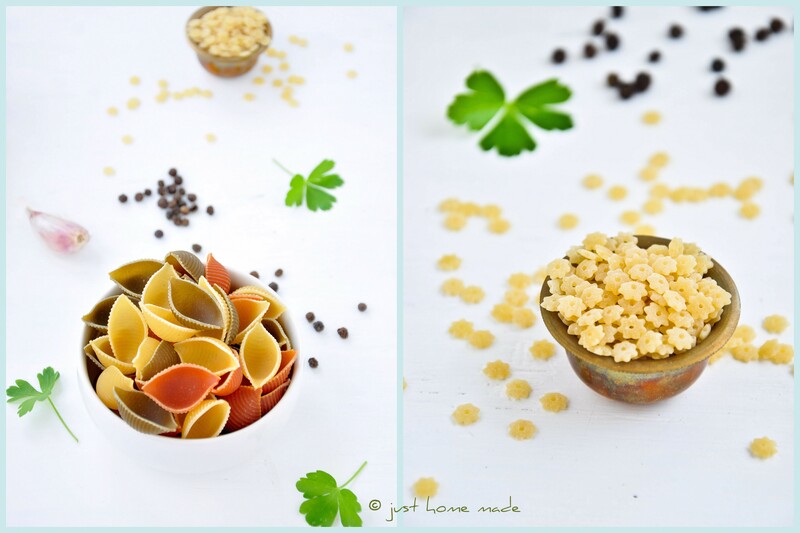 Her recipe got me thinking that pasta is the perfect showcase for some of my favourite summer ingredients. 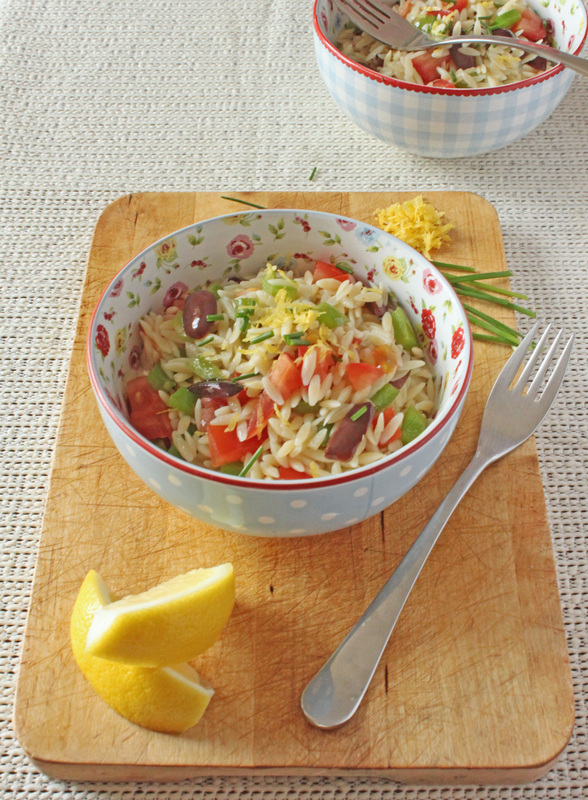 This dish is comes together very quickly, but is still full of flavour, especially if you use fresh summer produce. In a large pot, cook the orzo according to the package instructions. 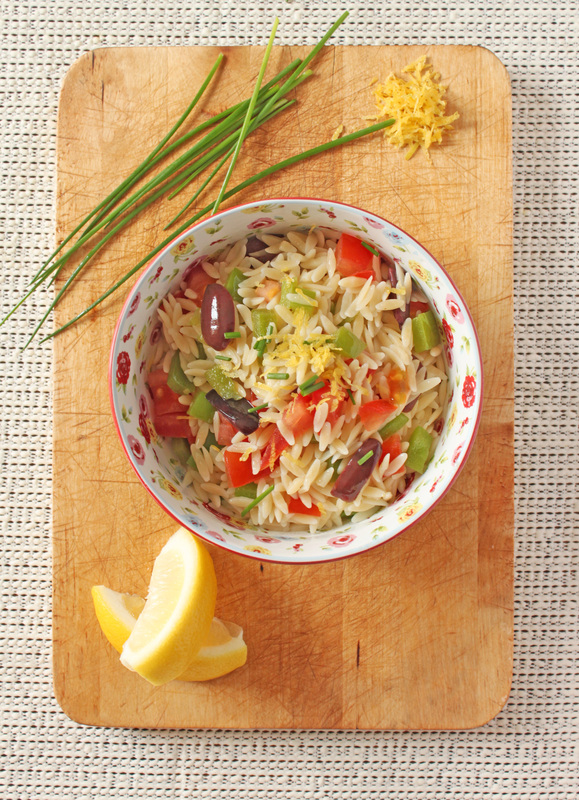 While the orzo is cooking, in a large sautee pan heat the olive oil on medium. Add the minced garlic to the oil. Once you can smell the garlic, add the tomatoes, pepper and olives. Sautee for two to three minutes; the peppers should remain crisp. Strain the cooked pasta, pour into a serving bowl then add the tomato mixture. Toss with the lemon zest and chives. The final guest post in the “Help Lynn Move” series is from Radhika of Just Home Made. 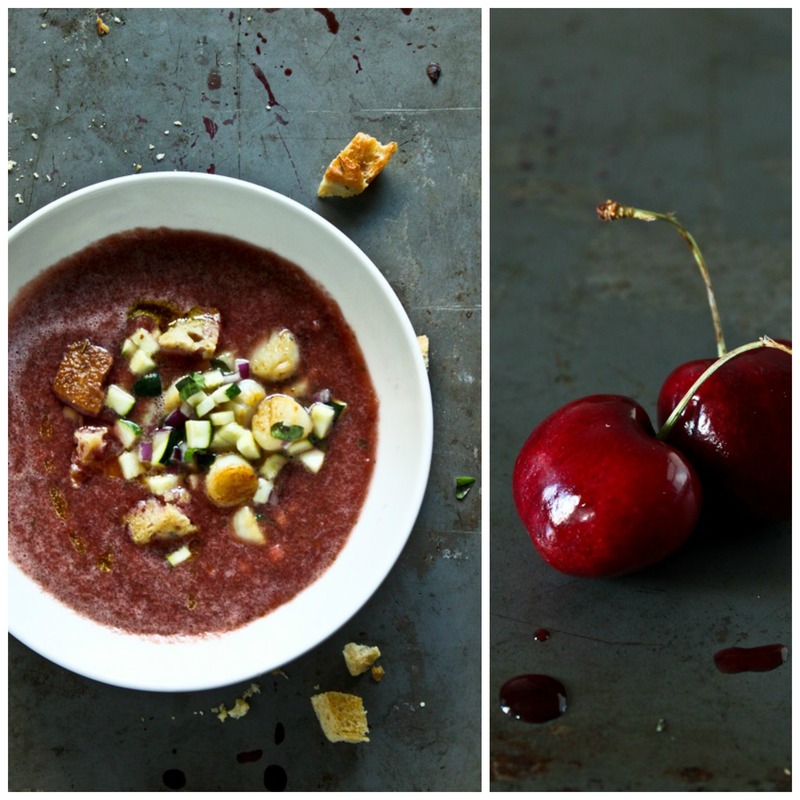 Radhika’s blog is beautiful, with amazing photography and wonderful recipes. What I love about it is the uniquness of the recipes, like these Saffron and Cardamom flavored Sweet Semolina Balls . I was very excited to see what she would come up with for the guest post, and I was not disapointed. I hope you enjoy this post as much as I did, and please take the time to check out her site! You know how casual random acts can lead to nice things? For instance, casual browsing onFoodgawker brought me to pause at these Egyptian Date Crescents that I instantly fell in love with for, I hardly find eggless pastry based desserts that easily. This blog hopping then led to twitter connection. What are tweets meant for? And that is how I got to know Lynn (@LynnLawandi on twitter) was looking out for someone to guest post while she is moving in and out of condos. Happy to help I was and so was Lynn and that is how this special post has come alive. Lynn has quite a few egg-less desserts like Good old-fashioned Apple Pie, Pear Caramel Ice cream, Plum TarteTatin to name a few. 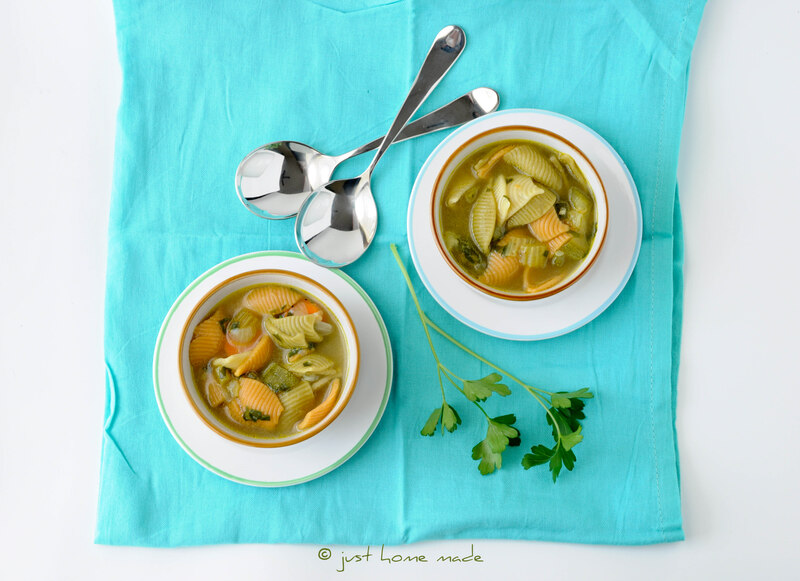 Of the first few times I made this soup without any pasta, we were left wanting for something more to it. Adding pasta, especially a tricolored one makes the soup filling on one hand and complements the vibrant colors of the vegetables on the other. Conchas (pasta shells) are one of my favorites and the tiny floral variant is loved by my little one. This soup is as simple as can be. Few simple ingredients and straightforward procedure. There’s not much required of you, all that needs to be done, the hot stove will do for you. 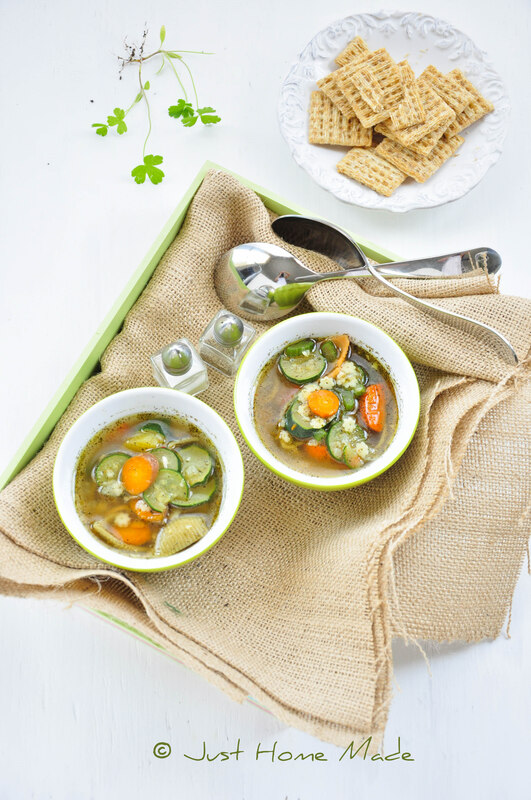 Just as it looks, the soup is light and healthy yet hearty brimming with the fresh flavor of vegetables, garlic and parsley. Now tell me, what is your favorite soup? Once again, a very kind blogger has come to my rescue with a great guest post. 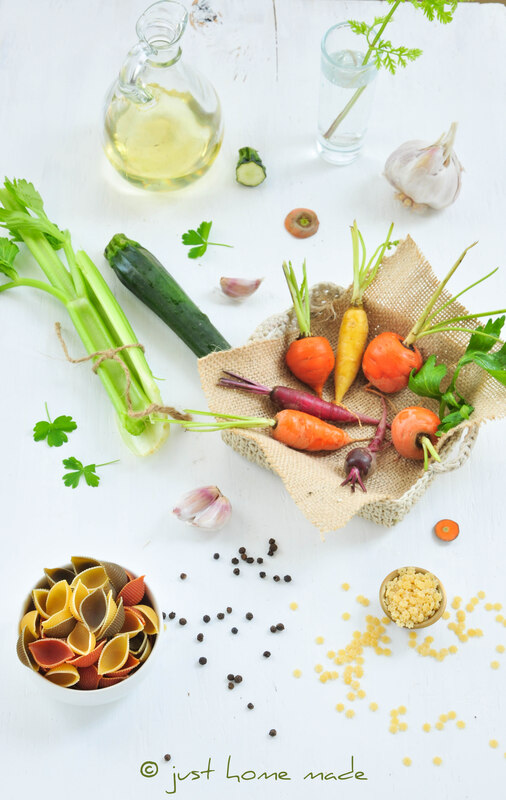 Sawsan, AKA The Food Doctor, from Chef in Disguise has written a great guest post. Chef in Disguise is full of wonderful recipes from around the world, and most come with stories of family and friendship. It’s a pleasure to read, and I’m so glad Sawsan has taken the time to share this post here! 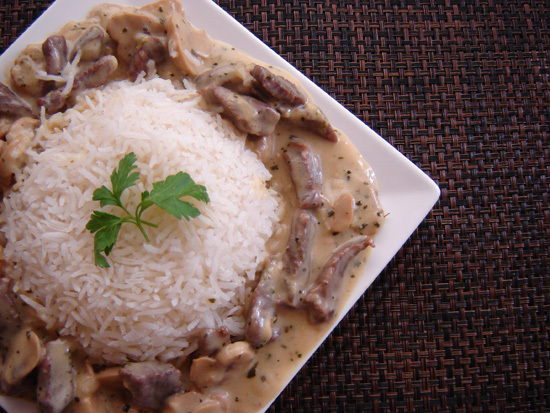 Beef stroganoff to me is more than tender strips of beef and mushroom cooked in a cream sauce. It comes with a set of memories. It is one of the first dishes that “converted” my husband to a mushroom lover (though he still wouldn’t admit it). You see, my husband had a long list of things he wouldn’t even try, mushrooms were on the top of the list followed by okra, eggplant and red beans to name a few. I personally loved mushrooms and was not ready to omit it from my menu without a fight. I started making dishes with ingredients my husband loved and sneaking in the mushrooms, it didn’t work at first but slowly and I mean SLOWLY things began to change. Straganoff was actually the first dish (that contains mushrooms) that huzz asked me to make. You can make this with cooking cream instead of my version with stock and heavy cream but I find mine slightly lighter. 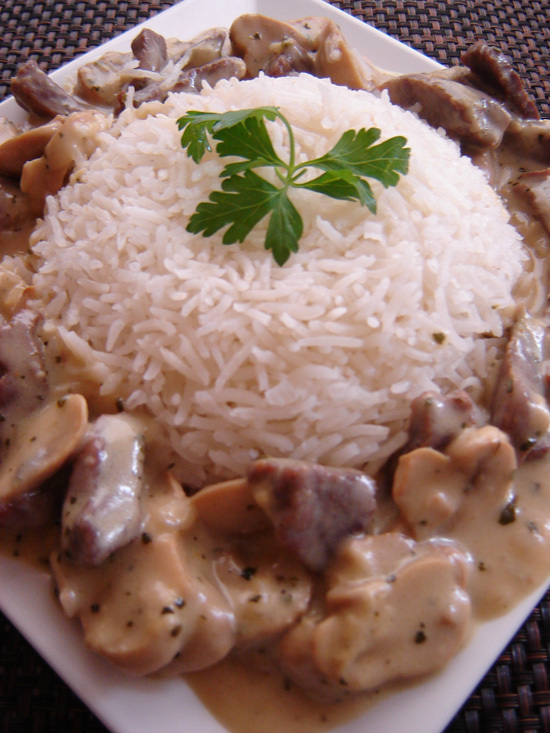 I love the addition of oregano, I think it does beautifully with both mushroom and beef. If you have never tried the oregano mushroom before, I urge you to give it a try but if you have something against oregano please feel free to omit it. It is entirely optional. 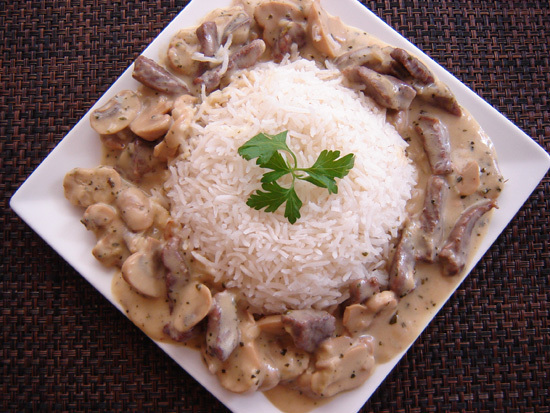 I usually serve stroganoff with rice or pasta (fettucini is my favorite) but I know people who love it with noodles, fries or a good slice of bread. It is entirely up to your taste . Melt the butter and then add the olive oil to the pan. Drain the beef strips season with salt and pepper,add them to the pan and stir occasionally for 5 minutes. Push the meat to one side of the pan, add the onions to the empty space. Add the flour and stir till it begins to change color to slight golden, add the chicken stock , allow to come to gentle boil . Add the mustard, soya sauce and oregano then lower the heat stirring occasionally. When the mix starts to thicken,add the heavy cream and stir to combine, cook for 5-7 minutes.